So reggae took me a long time to get. Yes, I’ve had a copy of Bob Marley’s Legend for ever, and occassionaly the odd reggae song broke through as a pop hit. But that’s as far as it went. Then a few years ago, having got a little bored with a whole host of my usual musical tastes, I made a concerted effort to “get” into reggae. Spotify, and a bunch of days spent working alone at home, was my saviour. And with a bit of effort it all finally clicked. One thing I like about reggae is the rawness of sound and attitude, something that – for all it’s wonderfulness – was a little lost in the music of Bob Marley. There’s a real punk spirit to a lot of reggae, that pre-dates the punk revolution of 1976/7, born in part from an outsider attitude and an anti-establishment mind-set. Interestingly, though, there was a real affinity for those original punks with reggae. DJs like Don Letts often played reggae between sets at punk gigs, and that cross-fertalisation spread into the music of some of the punk bands (The Clash’s cover of Police and Thieves being an obvious example). And then there was the whole Two-Tone movement, a blissful amalgam of punk and ska (a more up-beat version of reggae). There’s a good article here on the links between the punk and reggae. 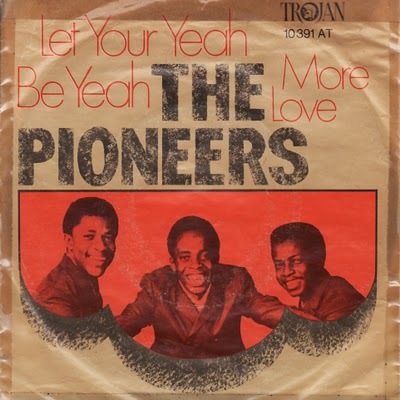 The Pioneers were a vocal trio from Jamaica, formed in the early 60s, and were amongst the first wave of reggae bands to score international (i.e. UK!) success in the late 60s and early 70s. Their first hit was with Long Shot Kick De Bucket (later covered by The Specials), but Let Your Yeah Be Yeah, a cover of a Jimmy Cliff song, was their biggest hit, peaking at #5 in the UK singles charts in 1971. And so to the song sheet. A few words of explanation I think are required for this one. Firstly the chords. I originally did a version of the song in an easier key (G). But I subsequently realised that playing it in the original key works much better. Putting aside that I find it easier to sing in that key (Bb), having to use barre chords really helps to get the reggae feel for the song – it means that you can get the choppy rhythms much better because you can dampen all the strings when you need to. So the chord diagrams in the sheet represent the barre-chords that I think work best with this. Secondly, there is the rhythm. I’m not going to give a lesson on how to play reggae here. Suffice to say that your best bet is to listen to the song, and get the feel from that. Basically I play it as a d-u-d-u rhythm all the way through, BUT with the first of those beats (the first down beat) dampened – i.e. with the fingers forming the chord shape on the strings, but not actually pressing down on the fret, AND the last down beat being clipped (i.e. the fingers lifting off the frets – but staying on the strings – almost as soon as the stroke has been completed). Listen to the song and have a play around and you’ll get the hang it. Categories: Reggae/Ska | Tags: 1970s, 1971, Pioneers, Reggae, ukulele | Permalink.